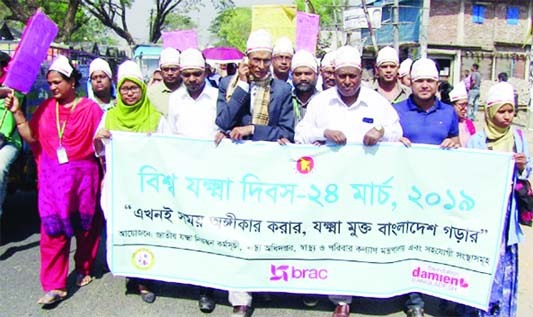 Madhukhali (Faridpur): National Tuberculosis Control Project, Health Department, Health and Family Welfare Ministry, Madhukhali brought out a rally on the occasion of the World Tuberculosis Day on Sunday. Health experts at a post-rally discussion put maximum importance on timely treatment of tuberculosis (TB) infected patients for eradication of the completely curable disease on Sunday. 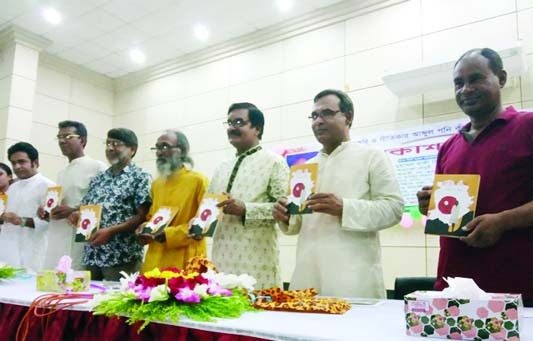 They viewed this at the discussion held at the conference room of Civil Surgeon Office in observance of the World Tuberculosis Day in Rangpur on Sunday. The Civil Surgeon discussed the present tuberculosis situation in Rangpur, reasons behind tuberculosis infection, government activities for prevention of tuberculosis and available cost-free treatment facilities everywhere. The health experts discussed the severity, symptoms and available treatment facilities of multi-drug resistant (MDR) tuberculosis, Extra Pulmonary, extremely drug resistant (XDR) tuberculosis and micro-bacterial (MT) tuberculosis in Rangpur. They also discussed functioning of GeneXpert Machines available at Tazhat Chest Disease Hospital in Rangpur and Chest Disease Centres (CDCs) at Gaibandha, Kurigram and Thakurgaon districts for diagnosing various types of tuberculosis. The chief guest suggested for examining sputum using computerized devices and facilities at GeneXpert Laboratory and CDCs equipped with modern GeneXpert Machines to effectively diagnose the MDR and other types of tuberculosis. "Early detection of tuberculosis infected patients is crucial side by side with conducting quick cough test, take preventive vaccines and full course intake of essential medicines without any interruption for their complete recovery," he added. 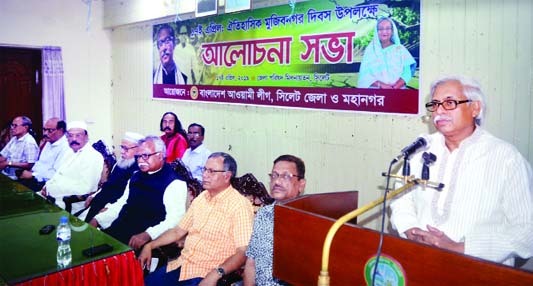 BSS from Rajshahi adds: Health experts at a post-rally discussion here on Sunday called for a concerted effort to bring all the undetected tuberculosis patients under proper treatment as the unidentified patients are the main challenge for building a TB free society. Offices of Divisional Director of Health and Civil Surgeon, Chest Disease Hospital and Rajshahi City Corporation jointly organised the discussion held at Luxmipur crossing here to mark the World Tuberculosis Day-2019. To mark the day, large number of health officials and workers, development activists and volunteers took out a huge rally from the office premises of Civil Surgeon to raise public awareness about the devastating health, social and economic consequences of tuberculosis. The theme of World TB Day 2019 is "It's time"- puts the accent on the urgency to act on the commitments to prevention and treatment. Damien Foundation, Tilottoma, Population Services and Training Center (PSTC), BRAC, FPAB, NATAB and Ashakta Punarbashan Sangstha (APOSH) supported it. Divisional Director of Health Dr Gopendra Nath Acharya, Superintendent of Chest Disease Hospital Dr Amir Hossain, Divisional TB Expert Dr Saiful Islam, Project Director of Damien Foundation Arif Iftikhar Mannan, Monitoring and Evaluation Officer of Resource Integration Centre Toslim Uddin and Divisional Manager of Brac Mazarul Islam spoke on the occasion. Dr Gopen Acharya said the existing challenges of Multi Drug Resistance (MDR) tuberculosis should be faced collectively as its consequences are very dangerous. He said there is no alternative but take concerted efforts to check the contagious disease as it usually spreads out through breathing of the affected patients. Dr Acharya underscored the need for conducting massive awareness and searching programmes to detect the TB patients in the slum and char areas of the district without further delay. It is no more a deadly disease and it is fully cured if the affected patients take proper treatment.